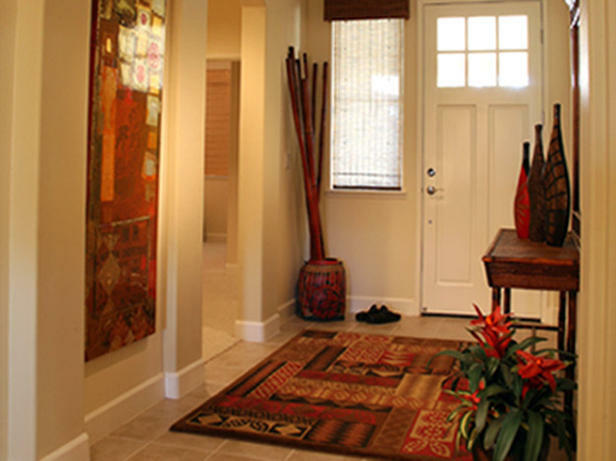 Does your entryway say “welcome”? Add a chest of drawers with a nice piece of artwork above it. The drawers will allow additional storage for those items that seem to create a pile right by your door. You can store hats, gloves, mittens, etc. Add a decorative bowl/basket/try on top of the chest to easily place keys, loose change, etc. right as you walk in your home. Place a bench in the entryway to provide an easy way for family and friends to come in and take off or put on shoes. A bench with a shelf underneath would allow easy storage for shoes once they are taken off! Add some throw pillows to the bench for added warmth to the space and hang artwork above! An accent chair with a small side table (with a lamp and small accessory such as a framed photo, candle, etc.) and artwork above also creates a comfy, welcoming spot to take off your shoes. The side table can also serve as a place to put your keys right when you walk in the door! Now I challenge you to take a look at your entryway… what feelings do you have as you walk into your house? https://redefineddesigns.com/wp-content/uploads/2013/03/hgtv-entryway.jpg 461 616 Jenna https://redefineddesigns.com/wp-content/uploads/2019/03/Redefined-Designs-logo-revised2017-RGB-small-for-w_e68147bef04a4c12bb7de8e8de138a0e.jpg Jenna2013-03-20 14:36:172014-08-02 15:19:27Does your entryway say "welcome"?